France divisee en 86 départements avec Sieges Archiepiscopaus et Episcopaux. 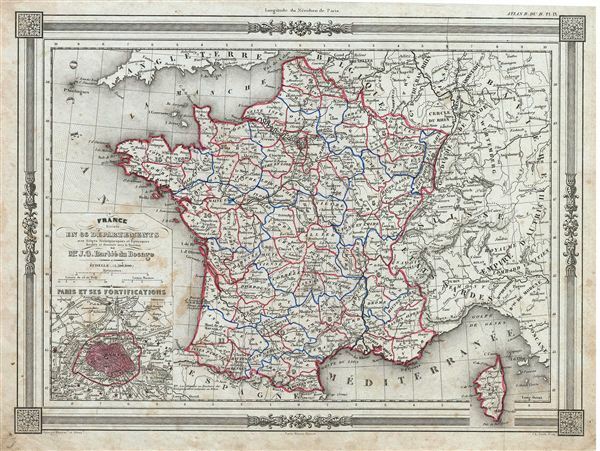 An uncommon and extremely attractive 1852 map of France in Departments. The map covers the Kingdom of France showing its various departments. It covers from the Nord in the north to eastern Pyrenees in the south and from Finistere in the west to Upper and Lower Rhein in the east. Also includes Corsica and parts of the Austrian empire, Switzerland and Belgium. An inset map on the lower left corner details Paris and its fortifications. Throughout, the map identifies various cities, towns, rivers and assortment of additional topographical details. The French Department system was established on March 4th, 1790 by the National Constituent Assembly to replace the provinces with what the Assembly deemed a more rational structure. They were designed to deliberately break up France's historical regions in an attempt to erase cultural differences and build a more homogeneous nation. Initially there were 83 departments but by 1800 that number increased to roughly 130. This map details 86 of those departments. Many of the departments that were created in 1790 remain the administrative districts to this day. The map features a beautiful frame style border. Prepared by J. G. Barbie du Bocage for publication as plate no. 7 in Maison Basset's 1852 edition of Atlas Illustre Destine a l'enseignement de la Geographie elementaire.